It used to be that aerial photography was available only to the richest newspapers. When Bob was the food critic for the Chicago Tribune, he remembers a photo shoot from a helicopter costing $10,000. Now with cheap drones, anybody can get an aerial shot. It’s called “Drone Journalism.” Two researchers from the University of Jyväskylä in Finland have a new book by that name. 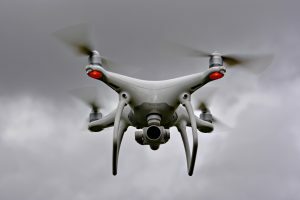 Besides the usual tips, they point out that a journalist’s drone can be stopped by the government. Dictatorships are famous for this, but even the U.S. government sometimes calls a halt. In 2016, Sioux Indians staged a major protest against a proposed oil pipeline in North and South Dakota. When the first dramatic aerial images of the police using water cannons against the demonstrators started to spread, the authorities quickly outlawed photo-taking by any fly-by devices. Besides getting caught up on drone journalism, we learned that drones are getting very sophisticated. When the battery is about to run out, the drone automatically returns to its starting point to be plugged in. No-fly zones can be programmed in, such as military areas and airports. Some media outlets are expected to soon have drones on their rooftops, to be sent out on assignment at the touch of a button. Gotchya! Alexa, the voice inside the Amazon Echo, Echo Dot and Echo Show, has thousands of “skills,” like games and apps. Now you can make your own. It’s as easy as typing your name. Besides these templates, there’s one for welcoming house guests, or you might want a birthday trivia game (find out who knows the birthday boy or girl best). There’s another for a bachelorette party, family trivia, a quiz game and even a kind of celebrity roast for friends; Amazon uses what it calls “lighthearted burns.” (Example: “You should think about being an astronaut on a one-way trip.”) In the “Doubles Troubles” game, the default questions include “Who complains the most when they are sick?” “Where did you go on your first date?” Get these wrong and you’re in big trouble. After we wrote about a free Virtual Private Network (VPN) for your computer, readers asked about getting one for their phones. Who needs it? Anyone who uses public Wi-Fi at airports and hotels. A VPN encrypts everything, shielding you from hackers, computers that have key loggers (recording all your keystrokes) and prying eyes. Here’s an obscure reason: You might want to watch the American version of Netflix in a foreign country. A VPN can make it look like you’re logging in from the U.S.
Should you get a free VPN or pay for it? A free VPN usually has no legal obligations to protect your identity. They might sell your data to third parties; otherwise how could they stay in business? Those third parties might use your info to send targeted ads your way. Oh, no, they’re sending me a targeted ad. What if I actually buy something? If you’re not worried about that, check out these freebies: TunnelBear, Windscribe and Hotspot Shield Free. They’re rated best of the freebies by TechRadar.com. Out of 100 paid VPNs tested, ExpressVPN came out on top, says TechRadar. ExpressVPN works in 90 countries and has a 30-day money-back guarantee. Prices start at around $7 a month. Hard to figure what would trigger a money-back deal. DigitalTrends rates “NordVPN” number one. Its speeds are reliable and fast enough for streaming high definition movies. It works in 59 countries. Privacy buffs like the fact that it doesn’t keep records of where you go on the Internet and won’t answer if anyone asks. It costs $70 a year. (You pay more if you go month to month.) The free trial is tricky, however. If you tap to accept a seven-day free trial, it asks for a credit card, which will automatically get charged if you forget to cancel. If you decline the seven-day trial, it offers a free three-day trial with no credit card required. We always balk when a company asks us to put in our credit card number. “Animaniac’s Lessons on Geography.” Searching on that phrase gives you a cartoon video with all the countries of the world run together into a delightful song. (Bob says there’s one mistake. Catch it if you can.) The song reminds us of one by mathematician Tom Lehrer, running through all the natural elements. 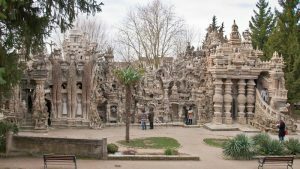 “The Palace built by a postman, using stones from his route.” Google that to get the story of a 19th century Frenchman who built “The Palace Ideal” at night from stones he collected over 33 years. There’s also a YouTube video. He must have had help because this thing is huge, with lots of statues and artistic touches. Kind of a masterpiece really. “The Five Best Smart Phones Under $250” is an article at Techlicious.com. They favor the Motorola g6, which has a better battery than the iPhone 8.